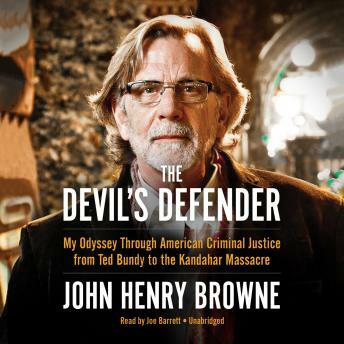 In the tradition of bestselling legal memoirs from Johnnie Cochran, F. Lee Bailey, Gerry Spence, and Alan Dershowitz, John Henry Browne's The Devil's Defender recounts his tortuous education in what it means to be an advocate-and a human being. For the last four decades, Browne has defended the indefensible. From Facebook folk hero the "Barefoot Bandit" Colton Moore, to Benjamin Ng of the Wah Mee massacre and Kandahar massacre culprit Sergeant Robert Bales, Browne's unceasing advocacy and the daring to take on some of the most unwinnable cases-and nearly win them all-has led 48 Hours' Peter Van Sant to call him "the most famous lawyer in America." But although the Browne that America has come to know cuts a dashing and confident figure, he has forever been haunted by his job as counsel to Ted Bundy, the most infamous serial killer in American history.